The Art School is pleased to welcome our 2017 Artists in Residence, who work in studios on our Kennington site and exhibit alongside our MA Fine Art Graduates in their September show. Jonny Green is a London-based artists with a career spanning nearly three decades. His work has been recently shown at the Saatchi Gallery, Blain|Southern, and the Royal Academy Summer Exhibition, among other venues. 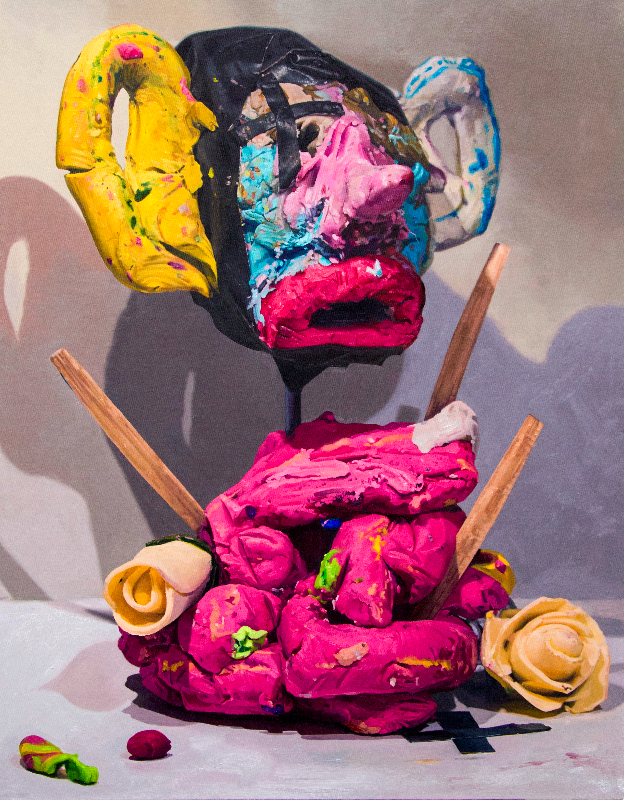 Green makes paintings of sculptures: Mad-men rendered crudely in plasticine and electrical tape or abject-looking re-animated brains adorned with filthy paper flowers and grubby clockwork parts. Each depicted object/character seems to be demanding recognition and validation from the viewer in spite of their manifest flaws, they seem to be trying to adorn themselves in an attempt to make their appearance more palatable. In contrast to the gleeful, almost slapdash making of the sculptures, their subsequent rendering in paint is meticulous. Green explains this approach as ‘an attempt to dignify and document or give testament to something that seemingly lacks dignity or a voice’. The resulting paintings are both still-life and portrait, animate and inanimate. 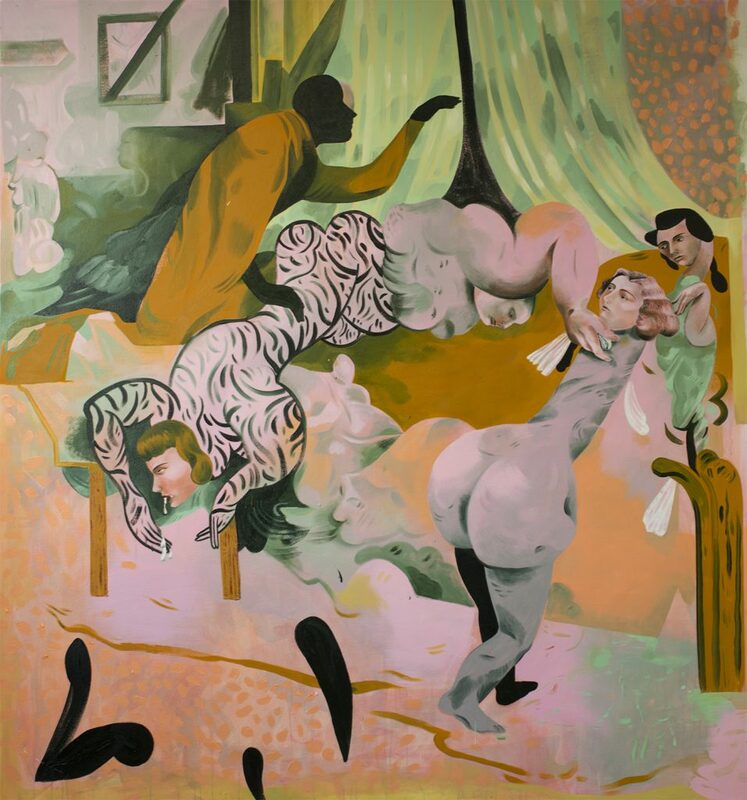 Jessie Makinson has participated in numerous solo and group shows around the UK. Her practice focuses on multi-figure paintings of women as a reference to the representation of women in art history and celebrity pop culture. The paintings are dense with recollections and impressions, questioning with humorous and often capricious proposals. The figures are difficult to separate from their place and relation to the rooms and spaces they inhabit. The eye is drawn first to their rich intricacies, before the planes surrounding them tilt and pull away. Scale affects pace, and the act of looking transitions between recognition and interpretation as it scans both the scene and its painterly textures.